Electric, Gas and Water utilities have always been traditionally regarded as income stocks by investors. Their high current yields, and the relative stability of their distributions made them a preferred choice for investors who are seeking current income from their assets. Utilities typically pay out a large portion of their earnings as dividends, which explains their slow dividend growth and high dividend yields. Most utilities operate as natural monopolies, which guarantees almost no competition in their specific geographic areas. It would be very costly to run two separate electrical grids, and such investment could take many decades to pay off. Thus utilities tend to generate stable earnings and revenues in any economic conditions, as people keep using water, gas and electricity in their daily lives no matter what. A main risk factor for many utilities is government legislation in regards to greenhouse gases, which could increase their costs over time. Such legislation could force utilities to purchase CO2 pollution allowances, which could cut into earnings. The heavy government regulation could be the driving force behind future growth however. A recent phenomenon has been the smart grid initiative. Because of the stability of their cash flows, utilities could afford increasing their dividends for long periods of time. 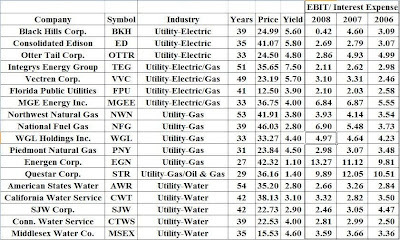 Most utilities that I have stumbled upon have had a history of dividend increases, followed by a steep dividend cut, which is then followed by another string of dividend increases. More often than not however, dividend cuts in the Utilities Sector are followed by dividend increases for several years until the dividend payment reaches or exceeds the previous levels. Because of this cyclical nature of utility dividends I view the sector as more suitable for current income generation that for solid dividend growth. Thus for a younger investor who has more than 2 decades until they plan on living off their dividend income in retirement, I would not recommend a high exposure to utilities. While current yields on utilities tend to be higher than the yields on S&P 500, dividend growth is much slower, which could erode the purchasing power of your utility dividend income over time. I view utilities stocks similarly to fixed income, as they are very sensitive to interest rates and have stable distributions. Utility stocks typically lag during strong bull markets as investors chase higher growth prospects. In flat or bear markets however utility stocks do not decline as much and they are further helped by their generous dividend yields. It is important to look at the dividend payout ratios, the EPS trends and the EBIT to interest expense ratio in order to gauge the sustainability of the dividend payment over time. The EBIT to interest expense or coverage ratio is an important indicator which shows whether utilities could afford servicing their debt obligations. While some investors focus only on the debt to asset ratios, I view the ability to service interest payments as an important factor that shows how sustainable the company’s ability to operate as a going concern actually is. Because of the slow dividend growth, I would not consider initiating a position in utilities stocks yielding less than 4% to 5%.